Land improvement activities of "Avalon" at Kyzylarai nature reserve in the framework of GEF/UNDP SGP project on ecotourism development have come to an end. Camping pavillions have been built, as well as trash containers have been installed in Torkora, Shaban and Myrzakozha places. Kyzylarai nature reserve administration has additionally installed one more pavilion in Auliye place independently and at its own expense. 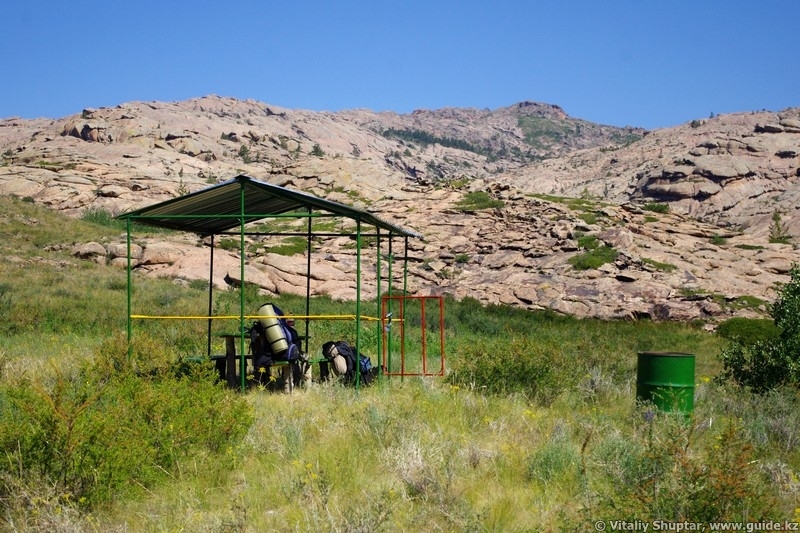 All the camps with amenities are located in the areas that may be easily reached by car transport, thus serving as starting points for trekking routes in the territory of the mountain and forest oasis, including climb to its highest point, Aksoran peak (1565 metres above the sea level). 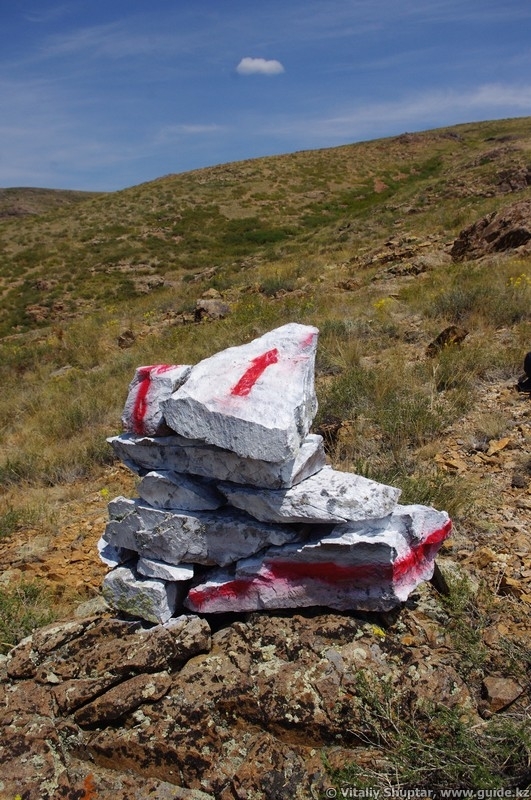 The paths leading to Aksoran peak from the south (Torkora) and north-east (Shaban) have been marked. In our opinion, the former trekking route, being the least complicated one, will be used by tourists more often than not. A path leading to waterfalls, situated in Myrzakozha place (in the southern part of the mountain range), has also been marked. In the course of field activities more than 120 guiding landmarks have been made, namely rock ducks, signs on trees and rocks. From the very beginning our aim was to make the guiding landmarks look as natural as possible, in order to minimize negative impact on the environment, as well as use materials available on the spot for their making. 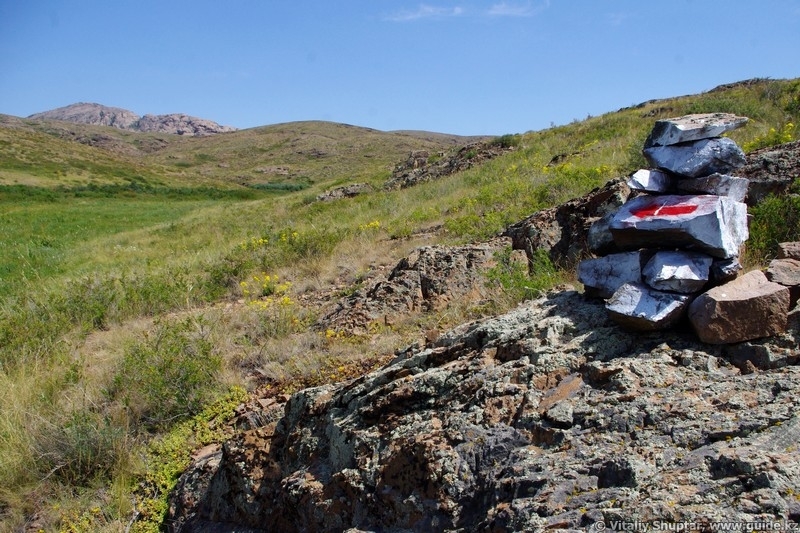 Hopefully, markings and guiding landmarks will make independent camping trips to the Kyzylarai mountains easier and clearer in terms of orientation. As a result of inspection of Myrzakozha place a decision has been made to change its role in the system of tourist routes. Earlier the place was merely seen as an area with some picturesque waterfalls, but now we are planning to mark paths connecting Myrzakozha and Shaban places in order to establish a circle route, which will include the climb to Aksoran peak. It must be noted, however, that this will be a goal of our future projects, just like marking of other equally interesting paths in the territory of the mountain oasis, including a rather extended route from Auliye place to "the roof of the steppes". All the infrastructure elements (paths and camps), which were arranged in the framework of the project activities in 2013, will be indicated on the map-scheme of Kyzylarai mountain and forest oasis, which we are planning to issue until the end of the season. Land improvement of Kyzylarai nature reserve is made by "Avalon" PF in partnership with "Aktogai forest and fauna conservation department" SE, as well as with active support from volunteers of Karaganda city in the framework of the second phase of the project GEF/UNDP SGP "Ecotourism in Central Kazakhstan: conservation of the protected areas natural resources and creation of economic opportunities in the rural areas".